What made it so good? The first season was good fun, but more on a conceptual level. It was also inconsistent and petered out towards the end. This second run was much better on practically every level, although the story could still be tightened and there are a few characters who haven't developed as much as I'd like (Frankenstein's Monster, Dorian Grey). 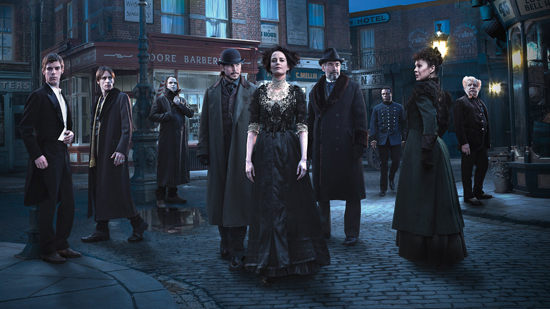 But I can forgive Penny Dreadful a lot, because it has a beautiful Gothic tone and can be very tense and thrilling when it wants to be. Plus, there's the delicious Eva Green doing astonishing (now Golden Globe-nominated) work as a tortured psychic, whose soul is the must-have thing for dark forces everywhere. It's fair to say Penny Dreadful focuses a little too much on her fascinating character, to the detriment of others like Sir Malcolm, but also easy to see why creator John Logan views Green as a muse. The best moment? Third episode "The Nightcomers" was a memorable flashback to a younger Vanessa being taught occult magic by her mentor, The Cut-Wife. And from that hour, the Cut-Wife's tragic end really tugged on the heart-strings and gave the ensuing season a much stronger emotional bedrock to work with in the present-day. Watch this if you like: The League of Extraordinary Gentlemen graphic novels (of which this is hugely indebted), Hammer Horror, Eva Green (have I mentioned how extraordinary she is? ), Gothic horror, vampires and monsters. I'm counting down my 10 Best Television Shows of 2015 this year, so check back tomorrow to see what's at number 7... the whole list can be read here.